The main reason behind the increasing price of fuel is the depreciation of the Sri Lankan Rupee, says the Joint Opposition. 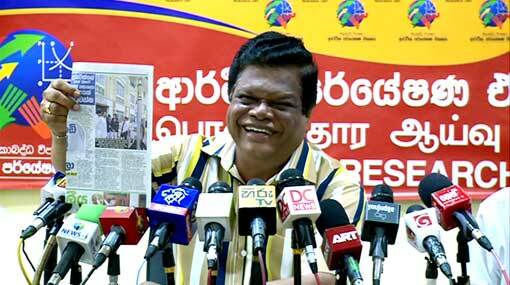 JO MP Bandula Gunewardane stated this today (16) holding a press conference in Colombo. Price paid for a barrel of crude oil going up as the Rupee depreciates against the US Dollar and the heavy taxes levied upon mineral oil are the major reasons for the high fuel price, said the MP. He says that the current government is reaping the benefits of the Mahindodaya Technical Laboratories build by the previous government. President Maithripala Sirisena donated a financial fund to a student who built a rocket at a technology exhibition held by a school in Gampaha. Commenting on this, Gunawardane said that the past regime worked to provide them with that technology. He introduced the technical subject stream to student syllabus when he was the Education Minister and it led to students taking a keen interest on technology, he points out. MP says that the current regime attempted to change the name of the Mahindodaya laboratories.